A4 Size 7.3 x 9.0 in. (186 x 230 mm) 8.3 x 11.7 in. A4 (Mounted) 7.3 x 9.0 in. (186 x 230 mm) 11 x 14 in. A3 Size 10.7 x 13.2 in. (272 x 336 mm) 11.7 x 16.5 in. Siddhi Lakshmi, meaning the "Auspiciously Accomplished One", is a powerful tantric manifestation of the great Hindu goddess Durga, with ‘accomplished’ implying both spiritual power magical abilities. Along with Shaivite-related regal goddesses like Guhyeshvari, Tripura Sundari and Taleju, she is one of the most secret and important tantric protectors of the Malla Kings, who ruled over the Kathmandu Valley between the 13th and 18th century. However, only a few initiated Newar priests or vajracharyas can enter her temple and see her iconic image, with two of her temples being located in the ancient Newar city of Bhaktapur. The most famous of these is the impressive Nyatapola, or ‘five-storey’ temple, which was built over a seven-month period in 1702 to placate the ferocious ‘sky-gazing’ head of Akash Bhairava that was wreaking havoc in this principality. Thus Siddhi Lakshmi manifested in order to control Bhairava, as she is the only deity capable of subjugating all manifestations of Bhairava, who is the most wrathful aspect of Shiva-Mahadeva. Various forms of Siddhi Lakshmi seated upon different aspects of Bhairava and Rudra-Shiva are carved on the 108 struts that support the five pagoda-like roofs of this temple. In this black and white composition the senior Newar artist, Gyankar Bajracharya (1954-2017), has depicted the secret goddess, Siddhi Lakshmi, in her nine-faced and eighteen-armed white aspect. Her nine magnetizing faces are assembled in three ascending tiers of five, three and one face. Each face has three alluring lotus-like eyes and is adorned with a tiara of five jewel-topped skulls. She wears golden earrings, necklaces, bracelets, armlets and anklets, a long garland of fifty severed heads, an embroidered silk skirt and apron, and an ornate silk scarf that loops around her shoulders. The circle of her inner aura is decorated with scrolling roundels, with a ring of floral scrolls, skulls, and stylized flames forming her outer aura. With her first two hands she holds a lotus-topped ritual vase in front of her heart. With her second pair of right and left hands she holds aloft the facial orbs of the moon and sun, and with her third pair she makes the boon-granting varada-mudra of supreme generosity and the abhaya-mudra of protection and dispelling fear. With her other six extended right hands she holds a vajra, a jewel-topped club, a white conch shell, an arrow, a trident, and an iron sword. And with her other six left hands she holds a ritual-bell, a chakra or discus, a lotus, a bow, a jeweled staff, and a skull-cup. She stands in pratyalidha posture as she leans towards the right, with her two feet resting on the palms of the ‘great god’ Mahadeva-Shiva, who kneels upon the form of a worldly god lying prone upon the cushion of his ornate lion-throne. Shiva has three eyes and four arms, and with his second pair of hands he holds aloft his twin attributes of a damaru and trident. Shiva wears a five-skull crown, gold ornaments, serpent earrings, a serpent necklace, and a tiger-skin loincloth. On a wide lotus pedestal at the bottom centre is the severed-head Mahavidya goddess Chinnamasta with her two yogini attendants, red Varnini (left), and blue-black Dakini (right). All three of these three-eyed tantric goddesses wear gold and bone ornaments, and hold a curved-knife and a skull-cup in their right and left hands. Chinnamasta also wears a garland of freshly severed heads, and her own severed-head rests within the skull-cup she holds in her left hand. Traditionally three jets of blood stream upwards from the three psychic ‘life-channels’ of Chinnamasta’s severed neck, which fall into the open mouths of all three of these goddesses. In the bottom left corner is a four-faced and ten-armed wrathful form of Bhairava, who stands upon a nagaraja or ‘serpent-king’ with thirty-three heads. He wears gold ornaments, a serpent necklace, a severed-head garland, a silk dhoti and a tiger-skin loincloth, and a flayed elephant-skin is streched across his back. With his first two hands he holds a rosary and makes the threatening tarjani gesture while holding the shaft of his trident in the crook of his left arm. With his other four extended right hands he holds a serpent, a curved-knife, a skull-topped khatvanga, and a sword. And with his other four left hands he holds a rope-noose, a skull-cup, a damaru, and a jewel-topped club. In the bottom right corner is the fierce four-armed form of blue-black Chanda-Bhairava, whose two feet are supported by a throne of five Vedic gods – Brahma, Indra, Ishvara, Vishnu, and Rudra. He likewise wears gold ornaments, a five-skull crown, a serpent necklace, a severed-head garland, a silk dhoti and a tiger-skin loincloth, and a flayed elephant-skin stretched across his back. With his first two right and left hands he holds a skull-cup and makes the bindu-kapala mudra. And with his other two hands he wields aloft a sword and shield. Auspicious symbols encircled his fiery aura, with jackals, crows, and a funeral pyre appearing beneath his ‘five-corpse’ throne. To the right and left of Siddhi Lakshmi are the emaciated and squatting forms of Rakta Kali and Swet Kali, both of whom have three eyes and eight arms, and wear five-skull crowns, gold and bone ornaments, severed-head garlands, silk skirts and scarves, and tiger-skin loincloths. Rakta Kali, or "Blood-red Kali", squats upon a five-skull throne and holds a stick and a skull-cup in her first two hands: a curved-knife, an iron hook, and a damaru in her other three right hands; and a severed-head, a corpse-club, and a trident in her other three left hands. Swet Kali, or "White Kali", squats upon the corpse of a worldly god, and holds a skull-cup and makes the bindu-kapala mudra with her first two right and left hands. With her other three right hands she holds a curved-knife, a damaru, and a sword: and with her other three left hand, a severed-head, a skull-topped khatvanga, and a shield. 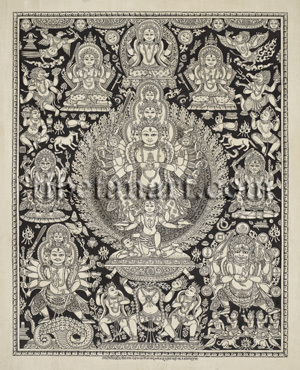 Directly above Siddhi Lakshmi is the ‘great-knowledge’ Mahavidya goddess Tripura Sundari, who sits upon a ‘corpse-throne’ made from the the decapitated heads of Vedic gods, with the faces of Brahma, Ishvara, Vishnu and Indra shown here. In her four hands she holds the subjugating attributes of an iron hook, five arrows, a rope noose, and a bow. To the left and right of Tripura Sundari are two other four-armed goddesses, the one at the left seated upon a corpse throne and bearing a sword and Vasudhara’s symbol of a jewel-ear of grain in her two upper hands. And Rudrani at the right, seated upon a jackal throne and holding the Shaivite attributes of a damaru and khatvanga in her two upper hands. The upper left and right areas of this composition depict several tantric deities and a host of ritual symbols. Two Newar khyak spirits appear above Rakta Kali and Swet Kali, both with their tongues extended. Above these are a lion-headed and an elephant-headed deity, and above again a flying kinnara and a garuda. Flesh-eating jackals, funeral pyres, arms making bindu-kapala-mudras, lingams, yantras, snakes, heads, parasols, and a wide variety of other ritual objects populate the background of this unique composition.